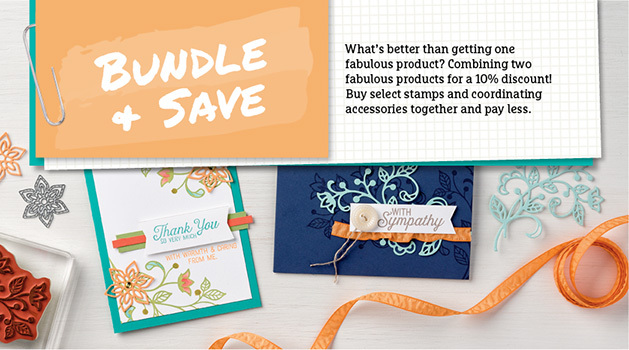 I don’t know about you but I love how Stampin’ Up! have designed framelits and punches that co-ordinate with some of their stamps, it makes crafting so much easier than having to fussy cut. I love having layers on my cards and scrapbook pages so it is not uncommon that I raise some of the stamped images to create a 3D look. Well now for the exciting news Stampin’ Up! have a variety of fantastic bundles available for you to purchase at a discounted price. If you would like to order any of the Bundles, please contact Patrice. You can also place an order online or find out more information about the product by clicking on the image below that interests you. Discount has already been taken off the stated price.